Post-National Day (and my birthday), I wanted to make the most of our time together this long weekend. I feel a sense of urgency because this baby is growing so fast. And also because of the dreadful feeling knowing that next week, work duty calls again. So, for three days in a row, we went close to nature. I am hardly a nature lover, because mozzies just love me too much, but since I had decided on a whim to sign myself up for a school field trip with her, I bit the bullet and just went. Of course I made sure I overpacked my Ju-Ju-Be Be Right Back with every cream and ointment we would need plus other toddler essentials. The field trip to Gardenasia was rather fun. Little Foot had been anticipating the visit to the “plants farm!” since I started mentally preparing her for it a few days ahead. And so here we are, accomplished plant potters! To many parents, a day out alone with the Little One is nothing. For me, it is still a leap of faith… taking baby steps to overcome my anxieties and irrational fears. I am hardly out alone with her since that near-fainting on the MRT episode when she was 8 months young. As I consciously worked towards overcoming my anxieties, every little achievement seems like I’ve conquered a mountain. And so it was that I successfully did this field trip with Little Foot without Papa Long in tow. Celebrate with me! 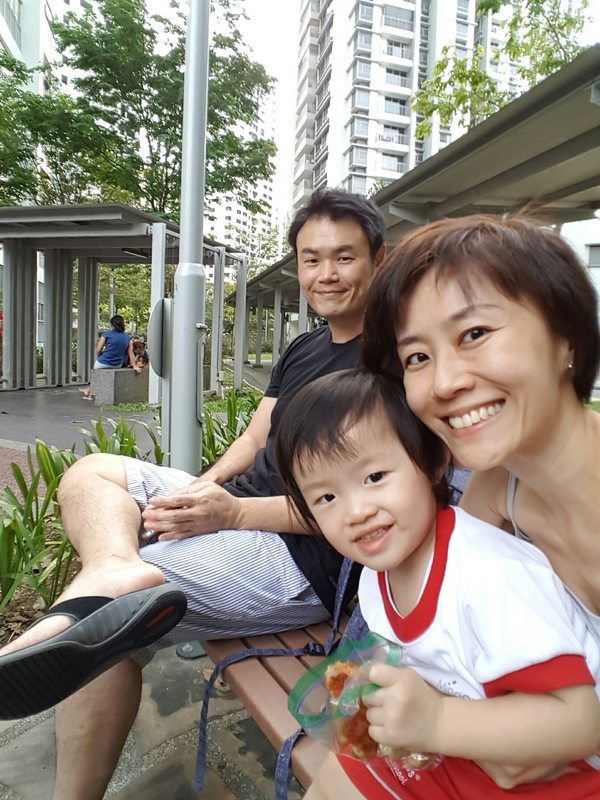 Then on Saturday, by chance, a trip to Little Foot’s BFF’s place brought us to Seng Kang Riverside Park. A little piece of mangrove and a floating platform…. the two toddlers had fun holding hands and walking around, and then chasing some bubbles. After her flirt with nature, we had a situation in McDonald’s… sighhh… someone tell me why she always misbehaves when she is with me and Aunty Lily… but that shall be another story for another day. At night before bedtime, Little Foot talked about feeding fishes. So it was that she went to bed holding that thought. I went to bed wondering if I shouldn’t have threatened to put her in the dustbin for her atrocious behaviour. On Sunday we woke up and I tried to get us all ready to go somewhere as painlessly as possible. There were of course the usual procrastinations when it came to taking a bath and brushing teeth. Papa Long suggested the Jacob Ballas Children’s Garden before we went to feed the fishes at another part of Botanical Gardens. Our first visit to the place, which would have rivalled all the nature walks we did in Perth, if not for our tropical weather which also meant the place is a home for all kinds od insects including mosquitoes! Little Foot was distracted by her packet of Jagabee which she has been demanding to rip open while in the car. So Papa made it a game — every house you reached is a checkpoint, and you get one chip when you get there. And so began the exploration of the little garden. Some of the areas were undergoing construction/upgrading, but there was definitely enough for a kid to be entertained. Conquering her dislike for sand for awhile because she likes going down the slides more! And look for some herbs too! And so as the sun starts to set on this week, I do think a little bit more of nature will be good for Little Foot. Even if my legs are now peppered with mozzie bites. Quick post before I go off to sleep. 20 Dec 2016. Little Foot officially promoted to N1 class. No longer in the babies class. I have mixed feelings… so proud of her for all that she had achieved in the last 5 months since she enrolled in the school. A little sad that I sent a baby to school and find that she has morphed into a toddler who speaks in short complete sentences, insists on putting on her owj shoes, disallows everyone from taking what she deem not to be theirs, who quizzes me “is that Papa’s car?”, and who informs me with great character (read big tantrums) if she is displeased. She sings on the way to school a lot these days, even though she does the customary clingy baby moves once we alight from Papa’s car. More mixed feelings when I picked her up during my lunchtime to find smaller toddlers in their own clothing walking unsteadily /being carried out of the school by their parents/grandparents. The adults told me they were there for a trial class, guess they wanted to see if it was what they wanted. I’m reminded that her teachers are no longer the same. She is yet again thrown to the winds of change. I’m reminded repeatedly that Little Foot is no longer a baby. Not yet 25 months, but like it or not, she has to progress yearly with those born in the same year. Even if she could be 11 mths younger. Didn’t we just blow out the two candles on the cake a couple of weeks ago? Dear Little Foot, I know you can hold your own in a world where you will have to first play catch-up, but then things will even out with time. In a world where you will be thrown out of your comfort zone regularly. Strangers have marveled at how well you can speak… they can make out the songs you sing and figure out the consonants you are not able to pronounce yet. And you have shown me that you are a survivor many times over (I still recall how you replied me when I asked you if your classmate who suddenly turned into a biter managed to take a chomp at you and you replied me very matter of factly that “E beat T!” Oops, I guess you managed to fend your itchy gums friend off!). Your teachers too have told me how impressive you have been, catching up with your classmates. Always baby in my eyes… and still leaving me to wonder when the day will come when you stop needing me to fall asleep with you while you comfort latch. Always my baby no matter how tall you have grown. Always a baby even if one day you no longer need me to carry you from the car to the class. Hope the new class will be as fun and exciting for you! Let’s stay positive! A photo taken over the weekend. 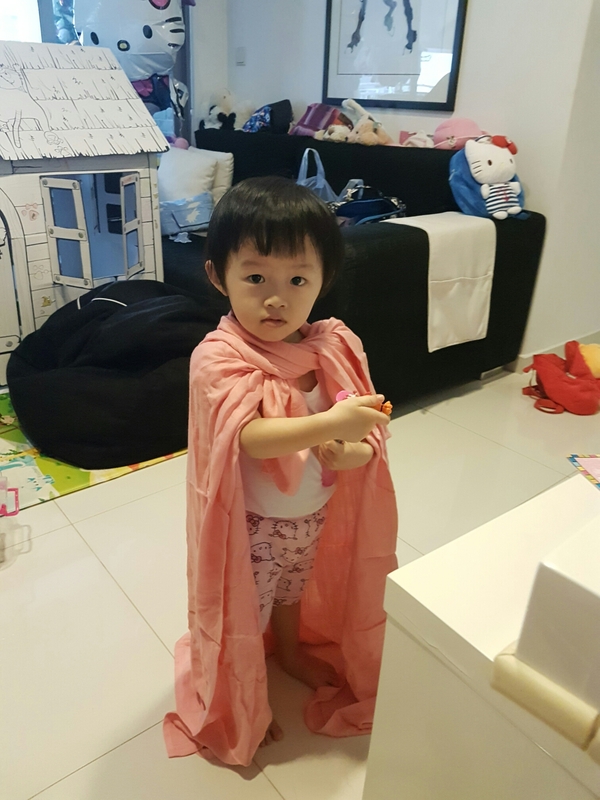 A Cape for my little superheroine!